Of late, there has been many attempts at attacking the unity of the nation through the skewing of historical facts. Unfortunately, many in the government, too, do not have institutional memory of what our forefathers had gone through to allow the formation of the Federation of Malaysia. The same lack of absence of institutional memory has also contributed to inability by many in 2011 to rebut Mat Sabu’s claim that the policemen who died in Bukit Kepong were ‘running dogs’ of the British colonials, and that the Communist Party of Malaya (CPM) were true fighters for the independence of Malaya, while Ronnie Liu of the DAP sang the same tune in 2005. I wrote at length to debunk Mat Sabu, whom I regard as DAP’s own ‘running dog.’ Since then I have embarked on my personal crusade to explain to the people through talks and forums about how the British came to Malaya, the treaties, who were colonised, which parts of Malaya that were not colonised, and what the CPM was fighting for. On Malaysia Day 2016, I began posting about the making of the Federation of Malaysia. I started off with the concept of Malaysia, followed by the consultations between the Government of Malaya, the British Government, the representatives from British North Borneo, and the British colony of Sarawak. Then I wrote about the Reid Commission and reaction from our neighbours. The last part covered the reasons we have Hari Kebangsaan and Hari Malaysia. You may want to read the above links before I get into the heavy stuff. Between now and Hari Malaysia, I shall write about the Sabah 20-Point Agreement. 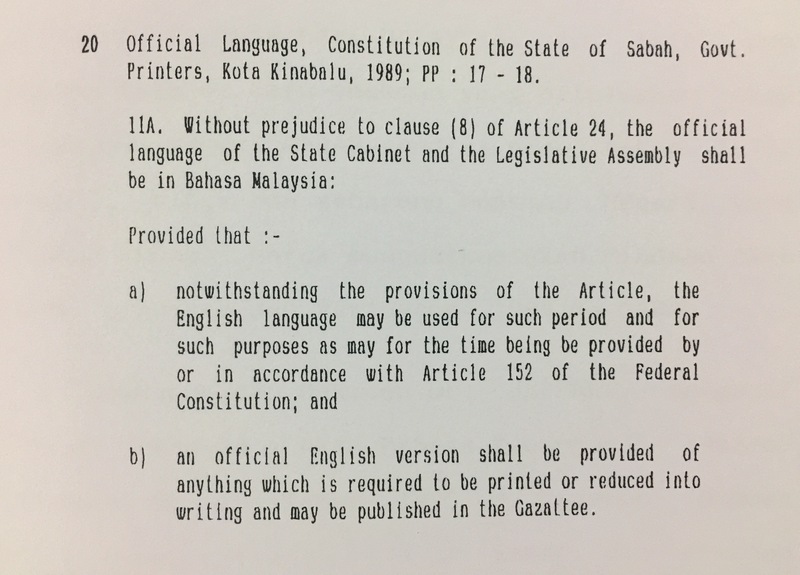 In 1987, Dr Jeffrey Kitingan had commented on the Memorandum on the 20-Point Agreement for the Inclusion of Sabah into Malaysia. 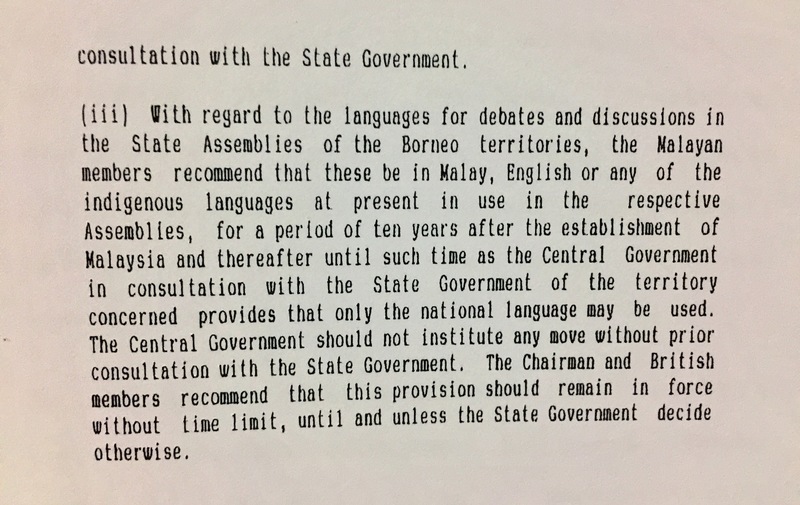 This memorandum was presented by the leaders of British North Borneo to the Cobbold Commission as a prerequisite for the inclusion of Sabah into Malaysia. 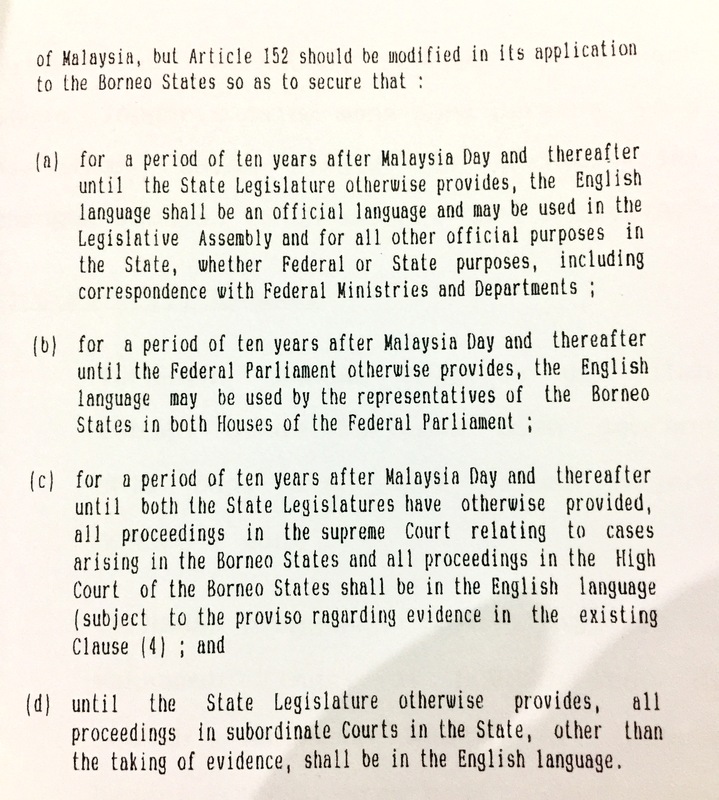 However, the notion that this memorandum had been accepted in toto as the basis of British North Borneo’s inclusion into the Federation of Malaysia alongside the colony of Sarawak, the state of Singapore, and the states of the Federation of Malaya is inaccurate or baseless. The contents of the Memorandum was not an agreement made by North Borneo, Sarawak, the British Government, and the Government of Malaya but were rather demands made by the leaders of North Borneo as a precursor to the consultations. What became the basis for the inclusion of Sabah are the points that had been agreed upon by all parties, no more and no less. After all, why had the leaders of North Borneo agreed for the colony to be included into the new Federation had there not been an agreement for that to happen in the first place? The lack of understanding as well as misunderstanding of what had been agreed as well as the developments that had taken place since has presented the exploitative opportunity for certain elements to create resentment and anti-Federation sentiments among the people of Sabah. Therefore, I shall endeavour to explain and counter the points raised, not only to educate those in Sabah, but to also educate the rest of the people of Malaysia, as well as those in the Federal Government on the latter’s commitment towards not only Sabah, but also Sarawak and the specil privileges that have been accorded to them. 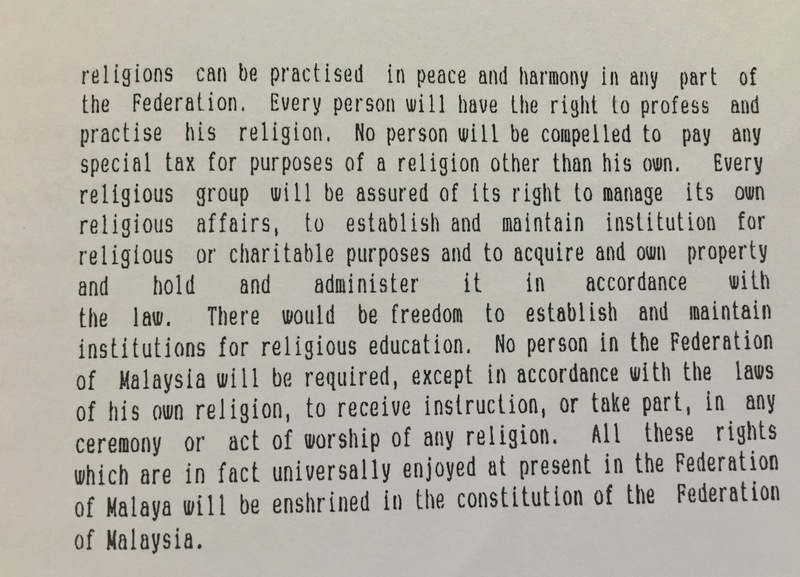 The Federation of Malaysia Agreement, 1963. In the next part, I shall write about the first point of the memorandum – religion. In the mean time, have patience and read Another Brick in the Wall’s take, as well as by The Right of Reply, on this issue, written a few years back. 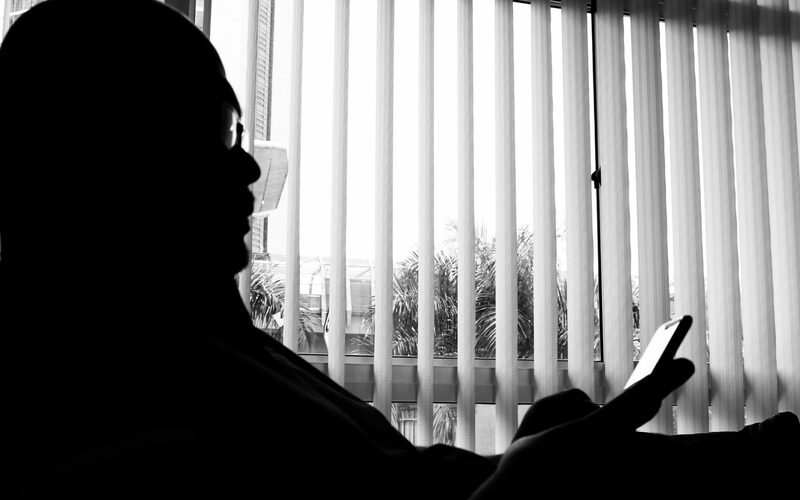 This article is a continuation from The Road to Malaysia: Part 2 – Consultations. In Vietnam, Laos and Cambodia the communists were making advances while the number of American servicemen in Vietnam tripled the number sent in 1950. In Indonesia, the influence of the Partai Komunis Indonesia on President Sukarno was strong. In Singapore, all the political parties except Singapore UMNO accused the PAP of having carried out negotiations to be merged with Malaya without first consulting the people. This gave ammunition to the communists in Singapore and their sympathisers to attack both Lee Kuan Yew and the Tunku. In British Borneo, the communists and their sympathisers tried to intimidate the natives thinking that it would work as it did in Singapore. Truth be told, it had quite the opposite effect. Lee Kuan Yew observed that as in Singapore, those anti-Malaysia in Sarawak were the Chinese communists, chauvinists and their sympathisers, while in North Borneo, they were Chinese businessmen and Chinese who were under the influence of individual British officials who were opposed to the Malaysia Concept, or ignorant of it. Kuan Yew noted that the direct links between the Chinese in Perlis throughout Malaya and Singapore to the British Borneo are the Chinese newspapers. Hence, Kuan Yew suggested to the Tunku for the Chinese chauvinists be separated from the Chinese communists and the two groups should be separated. Ghazali Shafie, Permanent Secretary to the Ministry of Foreign Affairs of Malaya. They were first brought to the Astana, a house that was built in 1870 by the second White Rajah, Charles Anthoni Johnson Brooke as a wedding gift for his wife, Margaret Alice Lili de Windt. It had been occupied by the British Governor since 1946. Ghazali Shafie could not help but notice a Jawi inscription at the entrance of the Astana left by one of the Brookes “BERHARAP LAGI BERNAFAS, (Have Hope While There Is Still Breath)” perhaps an apt motivation for the colonial officials who did not want Sarawak to be part of the Federation of Malaysia. The Brookes had built the Astana on the northern bank of the Sarawak river because it was where the Malays were. The Brookes depended on the Malays for safety and security, the Chinese for prosperity and trading, while the natives were not entirely trusted. The same compartmentalisation was practised in Sarawak by the colonial officials after taking over the state from the Brookes in 1946. The first groups of interviewees were interviewed in Kuching on the 21st February 1962. The first group amongst these interviewees was extremely pro-Malaysia. They were led by Abang Mustapha, Datu Bandar of Kuching. The second group was led nby Ong Kee Hui from SUPP. 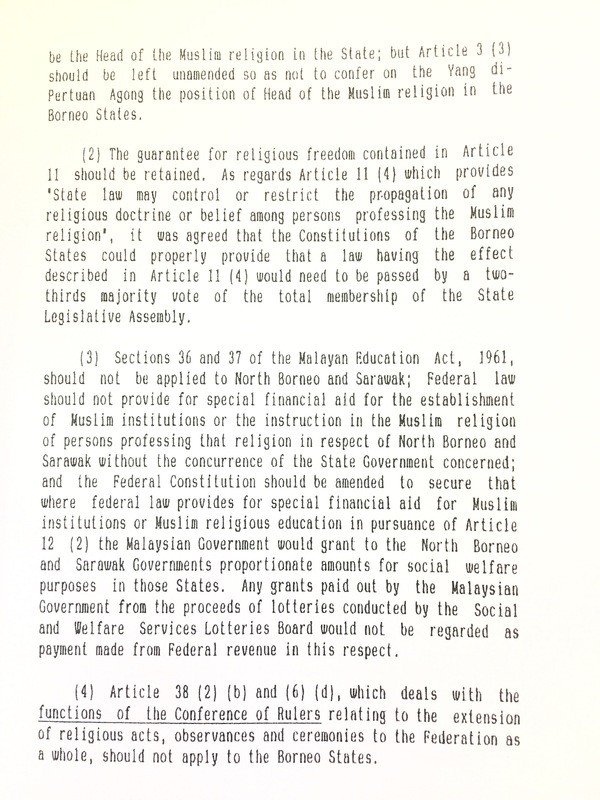 This group was against the special rights to be accorded to the natives of Sarawak unless if it is not stated in the to-be-formulated Constitution. This group had a contempt for the backwardness of the natives and had regarded their leaders as men of no consequences. This stand prompted an Iban by the name of Jonathan Bangau whom the SUPP had nominated as the party’s leader in Sibu to resign. The next day, another group of Chinese in Kuching were interviewed. Their spokesperson, a Chinese woman, twisted and distorted events in Malaya into something truly hateful. She accused the Malayan Government of policies that turned very young girls into prostitutes and had labour laws that accorded workers not more than Ringgit 1.50 per fourteen-hour working day without holidays! When these allegations were countered by Ghazali and Wong Pow Nee, she informed the Commission that she had read the stories from Chinese newspapers to which Wong Pow Nee murmured that these must have been communist publications. In Bau and Simanggang (now Sri Aman), banners and placards expressing anti-Malaysia slogans in Chinese characters plastered the town in anticipation of the Commission members interviewing residents there. The scene was different in Kanowit and Kapit. People shook the hands of the Commission members, especially the Malayan ones. One of the Tuai Rumah even held Ghazali Shafie’s hand as they walked through Kapit town. They were all awaiting the arrival of Malaysia! However, Ghazali learnt that under the colonial administration the Iban had suffered oppression and suppression. This began when Sarawak was under the Brunei Sultanate and continued under the Brookes and subsequently the British. When they faced the Commission, they were all for Malaysia and some even emphasised on the need for a speedy arrival of better education and development for the Iban community. At Binatang (now Bintangor), the division between the wishes of the natives and the Chinese was most prominent. The natives were all for the speedy arrival of Malaysia while the Chinese were divided into two groups: one favouring a referendum, while the other favouring a Federation of North Borneo, Brunei and Sarawak – a line maintained especially by the communists. In North Borneo, the only negative views were given by the British officials and expatriates as well as the rich local businessmen. At this juncture, Ghazali noted that these British officials knew nothing or chose to disregard Harold MacMillan’s famous “Wind of Change” speech in Cape Town made on the 3rd February 1960. 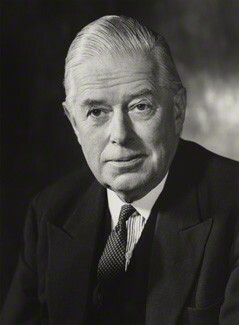 Cobbold, not having any experience in dealing with the Far East, succumbed to the ideas of these officials that in his draft, he recommended that both the British and Malayan Governments should have executive powers over the British Borneo states for five years. Both Wong Pow Nee and Ghazali believe that the Malayan Government would never agree to perpetuate colonialism in any form. 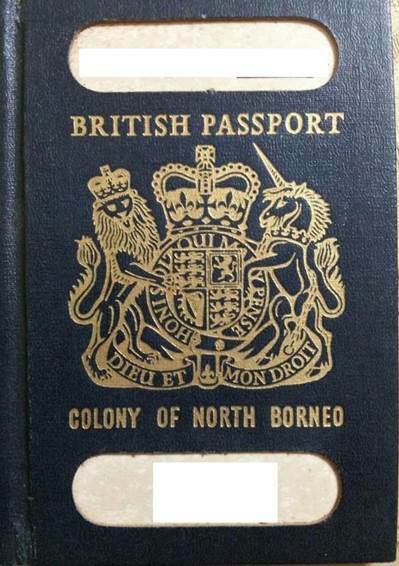 However, the two governments should discuss the matter should they want the British officials to stay on in Borneo in the service of the two territories. Wong Pow Nee quoted the state of Penang where he was once a Chief Minister to demonstrate the point that the British fears were groundless and that the Tunku, the Malayan people as well as the 70 percent who advocate the creation of Malaysia in the North Borneo and Sarawak would not agree to Cobbold’s suggestions as it would still be a form of colonialism. What more that the communists in Malaya, Singapore, Indonesia, China and the Soviet Union had branded the Malaysia Concept as neo-colonialism. 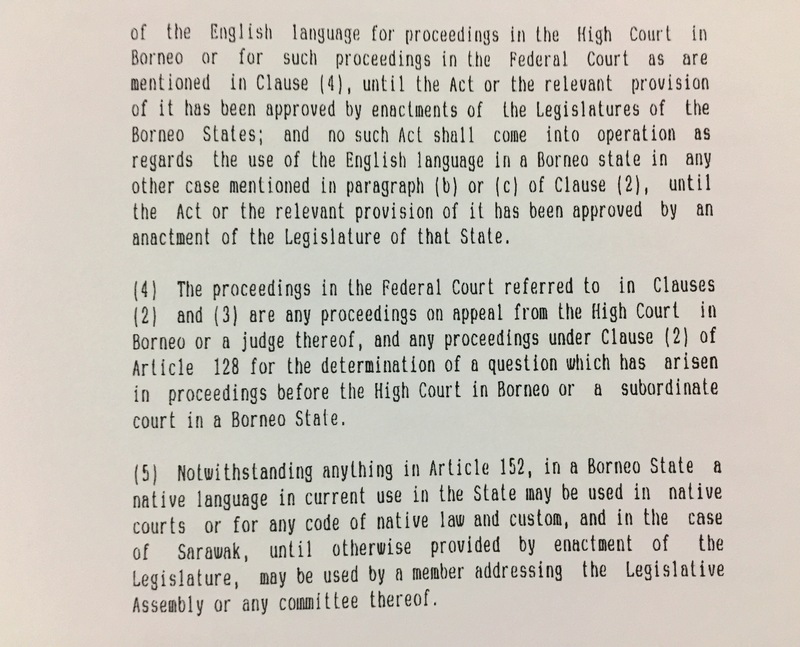 Interesting also to note here is that in April 1962, the Philippines House of Representatives had made a formal claim on North Borneo. On the 20th January 1963, Drs Subandrio, and alleged communist and also Sukarno’s Foreign Minister and Second Deputy Prime Minister announces Indonesia’s “confrontation” towards Malaysia. 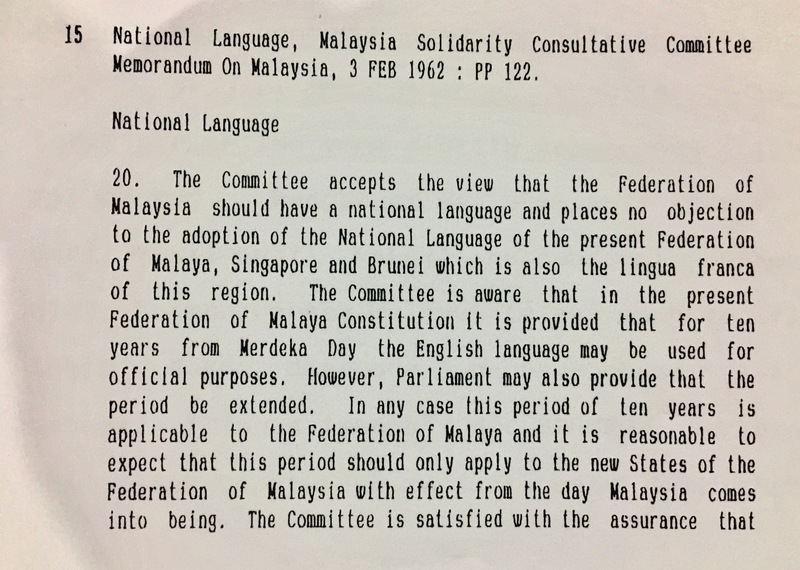 The Federation of Malaysia that would include the Federation of Malaya, North Borneo and Sarawak was to come into operation by the 31st August 1963. 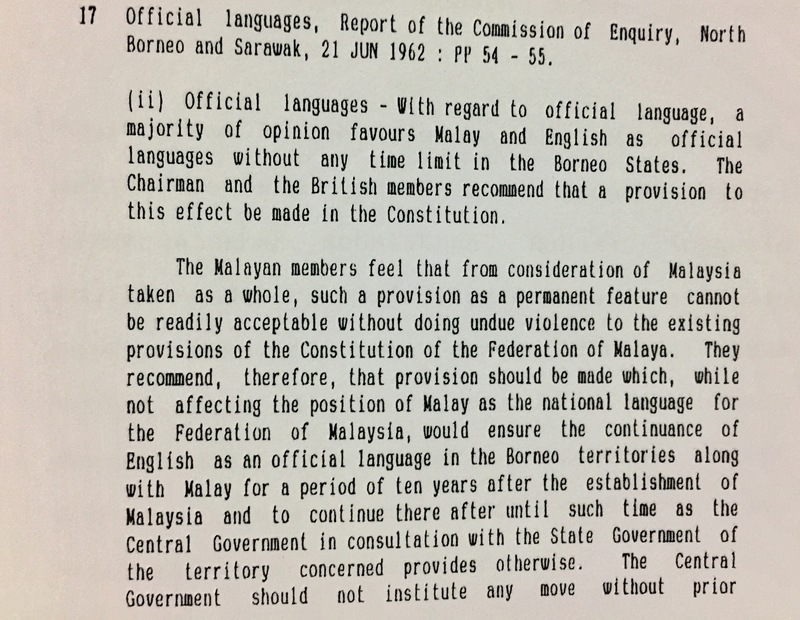 All in all, the IGC made recommendations in its report pertaining to the States’ Constitutions, legislative powers, financial provisions, elections, the Judiciary, public service, citizenship, immigration, religion, education, the National Language, status of existing laws, the position of the indigenous races and transitional arrangements prior to the formation of Malaysia. 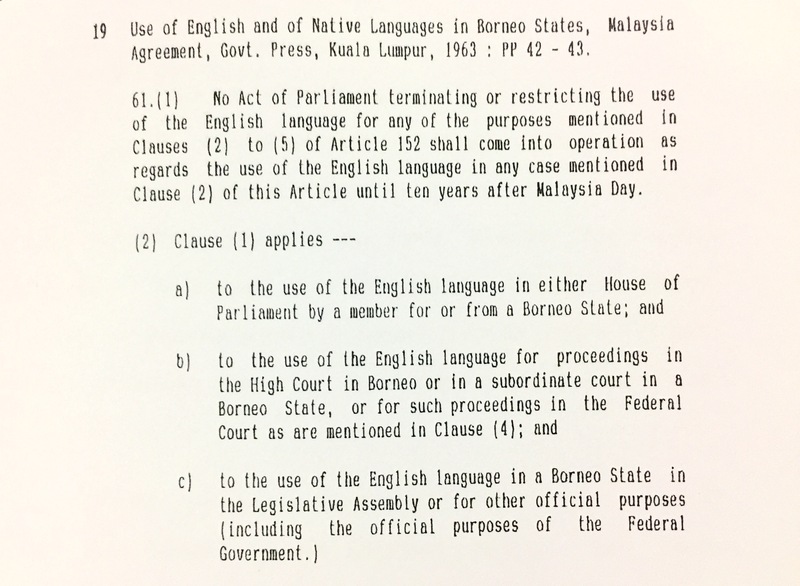 North Borneo was thoroughly satisfied with the IGC report and the North Borneo Legislative Council unanimously adopted the Report on the 13th March 1963. The Sarawak Government was satisfied and considered that the Report contained “generous terms of safeguards for Sarawak.” Stephen Kalong Ningkan as the Secretary-General of the Sarawak Aliance said that his party “fully endorses the Report.” Leong Ho Yuen, the Vice-Chairman of the SUPP said: “All in all, the Report is quite satisfactory. 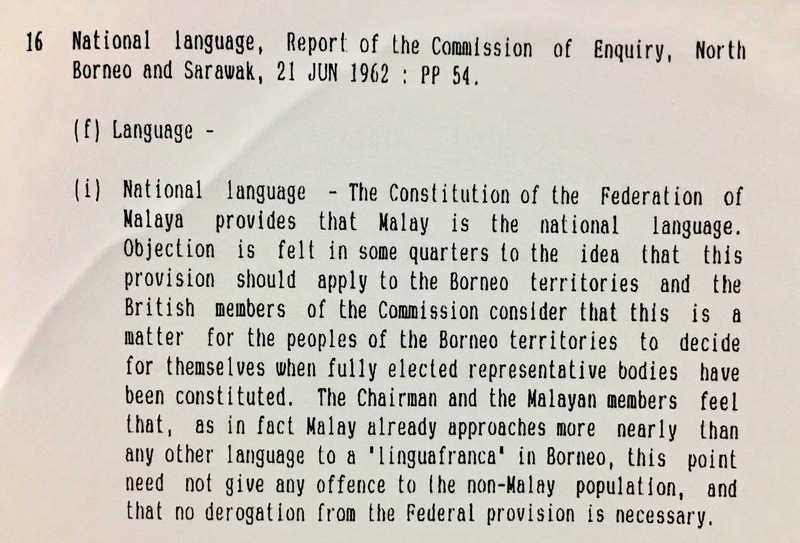 Though we cannot get all we asked for, at least we have been given a high percentage.” The Sarawak Council Negri voted unanimously to adopt the Report on the 8th March 1963, five days before North Borneo. Tomorrow, on Malaysia Day, we shall look into the self-rule granted to the State of Sarawak and why was Malaysia formed on the 16th September 1963 instead of on the 31st August. We will also look at what was said by those who were involved in parts of the process.